Don’t we all need a little more kindness sprinkled through our lives–both kindness we receive and kindness we give? I don’t mean large-scale, heroic kindness, but more of the small-scale embellishments that can put smiles on faces, give courage to persevere over the next few hours, and make ordinary lives more livable. Kindness is like a homeopathic remedy where a few small drops can produce big changes. It’s more than doing an occasional nice gesture or favor. It’s a sharing of presence. The cool part is that offering kindness opens our hearts as well. When I look at how I spend my days, there are so many opportunities to cultivate kindness in the most ordinary settings: in the grocery line, through an email, in a telephone conversation, and even on Facebook. If you hold your nose when I say Facebook. I understand. For some, Facebook has gone over to the dark side, part of the evil empire that’s out to manipulate and trash our lives. Then, there’s the matter of Facebook advertising. Sure, it’s a business that’s paid for by ads. But, does anyone else think it’s creepy to see the item you just looked at online–in my case some flashy Zumba pants–suddenly dancing before you on Facebook? When will Facebook start spying on those old sweaters in my closet? I can understand hesitating before investing any energy in Facebook. Still, Facebook is the way many of us are able to connect and communicate with people we care about when we can’t be with them. I use it to track the comings and goings on my island, to keep in touch with old friends, and build new online friendships. If we are going to use Facebook, let’s make it a force for good! My last week was rough. It started well enough, as my husband and I looked forward to welcoming the new dog we had agreed to foster: the rotund, but thoroughly delightful, Jackson. But on the first day of 2019, my life changed when my wonderful cat buddy, Barry, unexpectedly decided to take a chunk out of my hand. After fifteen years of cuddling together, I was shocked as well as injured by his bite. It got worse. So I decided to write… on Facebook. In my first, I shared excitement and whimsy as I awaited the arrival of our new foster dog. My friends echoed my enthusiasm, laughed with me, and added their congratulations. In my second post, I reported on being bitten by my beloved cat. Friends commiserated and told me to see the doctor. (I did). A couple suggested that, given the cat’s age, something in his health or condition might have changed. In my third post, I shared the excruciating decision to have our cat put down, on the day our new dog joined us. My friends embraced my tears, and perhaps shed a few of their own. I appreciated each comment, especially the ones full of an “I’ve been there, too” empathy. Not all posts on Facebook elicit such comments. People do seem to respond more to posts that involve kittens, puppies, deaths, and babies. But here’s the truth: when we respond to any post, we have an opportunity to infuse kindness into what we offer. I can testify: it matters. As you think about your day, are there times when you could pause an extra moment and connect to someone by offering a little extra kindness? Facebook may not be your ticket–that’s not the point. You send an unexpected email. You pick up the phone. Or bump into someone at the doctor’s office. Any of your default activities will do. You pause, you listen, you open your heart and you respond: “It’s so good to see you.” Or, “Thanks for telling me that.” “That must be hard.” “I’m so excited for you.” You choose words that echo your heart. When I researched the word kindness, I discovered that it shares roots with the word “kin.” When we are kind, we treat others as kin. I bet there’s a simple act of kindness you could offer today that will spread kinship in the world. Something beautiful can grow in the most ordinary settings. Sometimes you build community by talking, finding common interests, and slowly building trust. Sometimes you find community by…sweating. That’s what I did this past weekend in my Zumba (dance-fitness) instructor training. I almost didn’t make it. Life’s been a bit rough recently, and it was hard to imagine myself spending a day doing high-energy, Latin-inspired moves, while feeling burdened by some unexpected problems. I tried to picture myself among the clientele I thought might be attending this training: nubile, super-buff, exercise-freaks in their twenties, their butts thinly coated by tight, designer stretch pants. Would there be other 67-year-old women, with aching knees, vulnerable ankles and other physical limitations? Not likely. However, the idea of chickening out made me feel worse than the prospect of feeling out of place. And, thanks to a couple of handfuls of ibuprofen, I did survive all the high energy movement. It was fun, but what I really loved was taking a deep dive into a diverse community. The participants didn’t fit any stereotypes. They came in every color, and even from some different parts of the world. I danced next to a woman wearing a Hijab and form-fitting pants, and boy could she wiggle! Yes, there were some crazy designer leggings and tank tops. 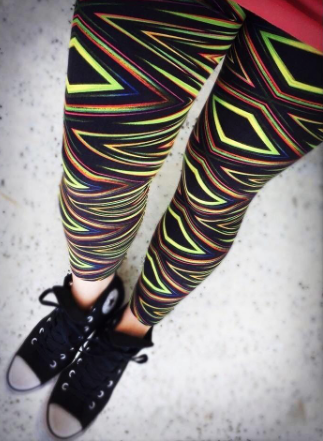 But it turned out that the insanely cool black and white tights I saw came from Walmart. Moving together connects us across different experiences, backgrounds, and countries. Great dance music is democratically distributed around the globe. Zumba was started by a man from Colombia who started life poor. He danced in the streets before he stumbled on a formula for dance-fitness success. Two Latin business partners joined in, and soon they had created a multi-million dollar empire of instructors and participants. You can find Zumba today in two hundred countries. No longer limited to Latin rhythms, Zumba now draws inspiration from music and steps worldwide. What stood out for me last Sunday, apart from the fun of dancing, was how fast our little rainbow classroom started feeling like a supportive community. I wished that my pale, winter-white skin could borrow some color from the beautiful Indian woman who was dancing next to me. (She, too, had the moves!) Participant ages ranged from 17 to 67 (yours truly). Did I tell you we came in many shapes, from finely chiseled to, well, big? What we had in common was that we could all shake (or try), laugh, and enjoy letting our hearts beat with the music we were hearing. We started the day with no introductions, no sitting around a circle discussing our goals, no check-in opportunities for me to give the instructor my list of physical limitations and tell her why I might not make it through the class, Nope. After sharing a few words at the beginning of class, the instructor got us up on our feet. Then she revved up the music and we were dancing. The instructor was a high-octane bundle of crazy-wild energy, whose might exceeded the size of her well-sculpted 5’4″ body. With a lingering Puerto Rican accent, she shouted out encouragement for us to follow her as she demonstrated some basic variations of core Zumba moves. The intense beat of the music seemed to bond us. Movement, like storytelling and other arts, is a gateway to community. I’ve written before about forming community through the amazing Story Bridge process. Expressive arts like storytelling, music, and dance encourage us to make connections with each other independent of our intellect or opinions. We open up for a moment, and enter a truer part of ourselves where we are free to move with less pretense, and, in the case of Zumba, more sass! I kept thinking that dancing is such a cool way to build community quickly, and span differences in backgrounds, experiences, and cultures. On the island where I live, the Zumba community is an amazingly supportive bunch. Maybe we don’t always need to talk through our problems. Maybe we should just dance the heck out of them. Red alert: The holidays are coming! Thanksgiving in the U.S. is followed by Hanukah, Christmas, Kwanzaa and a ton of holiday parties. Which means you should get ready for small talk. This week, I did a little research for myself and discovered a secret three-step technique you might want to use. If you’re the kind of person who thrives when placed in a big room with one hundred strangers for an undefined period of time, skip this post. (Please talk to me if you see me at such a party!) You’re a natural connector, and probably adept, without any training, at making small talk. For those of us who are introverted, meaning-seeking, thrive-on-deep-conversations types, parties with more than ten people (better make that eight) make us want to retreat. Given the need for small talk on the horizon, I decided to use the Internet to hone my skills. Just to be clear, I’m not using small-talk as a mating ritual. or trying to snare the man of my dreams (done that). I’m just trying to 1) survive a couple of hours, 2) maybe have a good time, and 3) learn a little. Not a big agenda, but worthy of some preparation. Note to self: not every conversation has to be weighty and meaningful. Small talk is not intrinsically less valuable than a deeper conversation, it’s just different. At the movies, a short subject isn’t considered bad because it’s not a two-hour documentary. I need to have a good attitude about small talk or I’m doomed from the start. I am naturally interested in people, although the idea of being locked in a room with a lot of them gives me the willies. (I don’t like boat cruises with no available exit strategy.) When I’m in a mood to be a total party turtle, I try telling myself to pull my head out of my shell and find something new about at least one person. Look happy, or at least don’t look dour. Think open-ended, open-spirited questions. If you want ideas, peruse this list of questions. Rather than doing a cold start by asking “If you could invite one remarkable person to dinner, who would it be?” pick an opening question carefully. It’s a great question, but it risks making you seem like a Martian who just dropped in. You might ask a C.P.A., “What do you like most about being an accountant?” but only if you suspect that people might like being accountants. However, in the unlikely event that you are Johnny Depp, you can ask me anything. I offer this special caveat for these politically apocalyptic times. Throwing in a reference to the drama of the day, i.e., “Did you see his most recent tweet?” is a flame starter, much like throwing a match on gasoline-soaked tinder. The problem is once the flame has died down, there’s nothing left to the fire and you don’t really know anything about the person you are talking with. Be like the Boy Scouts. Build a conversational fire slowly. Save politics, if you can’t resist, for when the fire of conversation has caught on. Make your partner look great. Think “Yes, and” to build on what’s been said. Keep the conversational volleys going by feeding in little bits of information. “Yes, and I found a great recipe for Margaritas that uses lemon gumdrops,” etc. Contrast the above improv approach with a method I sometimes use called “Secret Agent.” As a secret agent, I spend the whole party asking questions of others, without revealing a thing about myself. This is effective for spies but often leaves me feeling cheated because I haven’t shared anything about me and no one has even noticed! No wonder people don’t know about the book I’m writing. They’re not telepathic. Step one: ANCHOR your conversation. Find something in common with the person you are talking with to help you start the conversation. A mutual interest? A connection? A reason for being at the gathering? Or, a fascination with the hors-d’oeuvre tray? Anchoring your conversation in something your share will keep you from sounding like a Martian. The references can be mundane. I’ve heard that there are over one-hundred alums now in the Seattle area. Step two: REVEAL something about yourself. Build on the conversational anchor to reveal something about yourself. This builds safety and keeps you from playing Secret Agent. Now you can start asking questions that invite your partner to go further into the conversation. I could continue by asking about their experience at Yale, how their current experience taps what they learned at Yale, what they think of the school, etc. It’s up to you to show interest and keep moving things ahead. At mixer-style events, we aren’t meant to stay with one person the whole evening. (Introverts, remember this!) At some point, you’ll want to thank your partner and move on. Do it graciously. Acknowledge the conversation and maybe one thing that stood out about it. There are ways to be inviting while acknowledging the end of your conversation. However, just because you’re at a holiday mixer, don’t spend your conversation with someone scanning the room for your next partner. I hate when someone does that to me! It’s so annoying that I’d be tempted to change the subject and start talking to them about grief. (ha ha). But, with a bit of cautionary self-coaching, “Sally, don’t take it personally,” I’ll smile, take a holiday breath, and say, “It’s been great talking to you.” Then I’ll make a beeline back to the hors-d’oeuvres. Let the holiday games begin. Do you forget things? I do…and it bugs me, although the consequences are often minor. Selective amnesia is not such a bad thing. Think of it as a kind of spring cleaning of the mind, so you can free up some room for stuff that matters. That said, here’s what I’d be happy to forget…and what I hope not to. My childhood phone number: (WO6-0642). The star of Dr. Kildare: (Richard Chamberlain). The name of the girl down the street who bullied me: (Maureen). The teal dress I wore to the Junior Prom. I forget other things, and often it’s not a big deal. The reason I just came into the kitchen. The botanical names of the plants in my garden. Forgetting can also have consequences–embarrassing, but largely remediable. The list I made to take to the supermarket. Yet there are memories burned into me that I hope never to forget. The twelve people who were murdered in a Jewish Synagogue last weekend. The children who have died in school shootings. The stories of my grandparents and other ancestors, fast disappearing. The lives of the faceless refugees leaving terrorized lands. The children separated from their mothers at the border. That the marginalized: elderly, prisoners, disabled, or poor, are human like me. That our world needs elders and my job is to become one. That democracy cannot be taken for granted. That hope heals even in the worst times. Let the small stuff fade away, but hold on to what counts, like remembering what’s in the United States Constitution. And please, don’t ever forget to vote. Enough!! I hate to add anything to the pantheon of required government trainings, but I figured a little handbook was urgently needed at congressional hearings, so I created something you can keep in front of you at committee meetings, hearings, or public events where you want to look like a decent human being. I call it Disrespect for Dummies. Who’d have thought it would be needed? I’ve kept the list short and basic. (I’m also working on a poster for those who don’t read books.) The reading level is simple–about the level of a US Senator, member of Congress, or third grader. Because this is a draft, I welcome your suggestions. This way you can feel you have accomplished something positive after watching government hearings. Instead of just rushing to wash your hands. Not making eye contact when someone asks to speak with you directly. Interrupting before someone has even begun to make her or his point. Refusing to listen to an idea that is relevant to the conversation. Talking at someone rather than talking to them. Talking about someone like she (or he) is an “it.” This includes talking about a person in their presence or behind their backs. Tweeting while someone is talking to you. Making derogatory comments or off-handed remarks about someone during a meeting, often to an associate. Not responding in a compassionate way to someone else’s heartfelt emotion. Making sexual references to a person in public. Generalizing about a person because of their affiliation, such as race, gender, nation, or political party. Closing a meeting abruptly and arbitrarily while group members are waiting to be heard. Announcing your decision prior to hearing evidence. Hoarding information or evidence so that your associates won’t know what you’re talking about; bogarting. That’s my starter series. Yours? Passing laws that will directly affect a group of people without including them in the decision-making process in more than a peripheral way. Not passing laws that are needed to protect a group of people because you didn’t, well, notice that they were needed. Assuming someone is guilty because of the color of their skin or the sound of their last name. Tell me what you see…and then, even better, what to do about it. As I’m writing this, my friend Susan Partnow’s husband is having a laryngectomy, a difficult surgery that will take away his ability to speak, except through devices, and hopefully spare him from the cancer that has been hiding in his vocal cords. Chances are you know someone who stunned you by announcing, “I have fourth stage cancer” or something equally grave. What do you say? I’ve heard of situations where people actually hid from their friends or dropped contact because they didn’t know how to deal with the tragedy their friends were facing. A friend who survived a bout with cancer said she became a pariah at work as people stopped talking to her, acting as if they might “catch” cancer if they came too close, or were embarrassed about not knowing what to say. That was some years ago. Hopefully, times have changed. What hasn’t changed is that it can be really hard to know what to say in such a difficult situation. Maybe the question is “how do you listen?” How do you open your heart to receive what a friend in crisis has to offer when you start a conversation? How do you listen deeply with compassion, neither jumping to a conclusion, nor offering a solution, nor shaping their space? They didn’t have a clue. The very worst of all were the folks who told Treya that her cancer was a result of her thinking, which she could change with positive thoughts, affirmations, or visualizations. To tell such things to a vibrant and positive woman, who was doing everything she could to survive cancer was 1) insulting, 2) demeaning and 3) very cruel. As well as being nuts. Reading about the deep hurt unintentionally caused by telling a person in crisis what she should do, made me want to preach (contradicting, of course, my message), Do not tell people what they should do. Probably ever. But not when they are grappling with their life or their health, except, I suppose if they specifically ask for your advice. Even then, go lightly. If you listen, deeply, you’ll open the possibility for someone else to hear, in themselves, what they need to know. If you listen, deeply, you may open up a space of communion and dialogue that may itself be healing for you both. If you listen, deeply, you may open up your own heart and build its capacity to love and support. I don’t think it’s easy. It isn’t easy. Your heart may start hurting and you’ll need to take care of yourself after this kind of visit. I left my mother’s bedside so many times, both grateful for being able to sit in communion with her and feeling absolutely wrung out and wiggy. I’d go home, sit on the coach, and web-surf until I found some comedy. Find what helps you. What you can always do is pray, or send love from your heart to your hurting friends, asking for them to be given what is best for them (without assuming you know). Send positive thoughts. See them in light. Envision them healed. You can do all of this all of this on your own. If you’d like to have a beautifully articulated set of suggestions for supporting someone, read Susan’s words here. You’ll be learning from a communications pro and wise, wise woman. Finally, I have a request of you even if you don’t know Susan or her husband Jim, who will have completed his surgery by the time you read this. Just send them a good thought, some light from your heart, and hopes for healing. If that’s too big a stretch, think of someone you know who is hurting, and extend your loving thoughts to them.